Today was Carter's last day of PDO/pre-school/whatever-you-want to call it, and after I dropped him off this morning, I thought, "Hmmm... this might be a good time to do something about teacher's gifts..." His main teacher was covered, but there were still a few people I wanted acknowledge for making this such a great school year for my little guy. Mind you, I still needed to shower and go to a meeting before picking him up, so my time? It was a bit short. Yes, yes, I know. I should have thought of this before today. I need to spend more time in quadrant 2 on Stephen Covey's chart where I'm supposed to be doing stuff like planning, preparation, and clarifying my values, and less time in the quadrants where I'm putting out fires and watching T.V. I know all this. But here's something you may not be aware of: I'm not a highly effective person! Just your standard Hershey's Nuggets labeled a la PaperTrey. The little box is from Taylored Expressions. They are so cute and handy, and very reasonably priced. I'm sure a lot of you might just make your own, but I really like having some of these on hand for days like today. 1. The boxes will hold 16 Nuggets each. In order for them to fit properly, however, you need to alternate rows of the Nuggets being right side up and upside down. If you look at the first picture closely, you'll see that the first and third rows actually have the flat, 'bottom' sides of the nuggets facing up; the second and fourth rows have the rounded, top side facing up. Adhere your labels accordingly -- eight with the design on the rounded part of the Nugget, and eight with the design on the flat side of the Nugget. 2. One bag will yield about 35 Nuggets, so you can fill two boxes and eat three pieces yourself for each bag of Nuggets. 3. The tops of the boxes have an oval cut out of them. I used some of the acetate I've saved from clear stamp packaging to make a fancier window. In other news, have you been visiting the Verve Blog over the past couple of days? If not, you're missing out! Verve Visual is releasing FOUR -- yep! -- FOUR new sets on Friday that you are going to L-O-V-E! Sneak Peeks started yesterday and will run through tomorrow (that's when my project will be shown : ) ). Check out the awesome projects the Verve Design Divas have created, and then leave a comment on each day of previews to enter your name into the drawings to win free sets. Yippee! New stamps! Free stamps! Are those words not music to your ears?! Now you know what tomorrow will bring... Class Act Stampin'! See you then! Supplies used -- Stamps: Limitless Labels by PaperTrey Ink, sentiment by Sun Spirit Studios; Paper: Window Box from Taylored Expressions (Baby Blue Dark), Labels from PTI (#3207), random acetate, Georgia Pacific White for the tags; Ink: Cyan and Cranberry ColorBox Pigment Brush Pads, Real Red; Accessories: CuttleBug RedTag Alphabet tag die, red liner sticky tape, ribbon, Hershey's Nuggets. 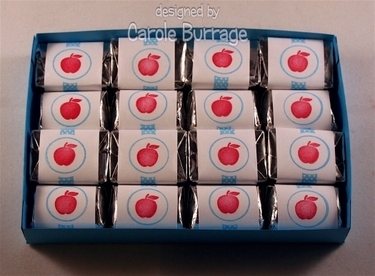 Carole these are wonderful.. The teachers are sure to love them. See, you think you're not a planner, and yet you had these great little boxes (and labels and nuggets?) all ready to go, it was just a matter of putting them all together. You even had an apple stamp!! I'd have waited until the last minute and had no supplies to throw anything together!! These are ADORABLE! These are super cute!! Love the ribbons and the little apples are so cute! !